Spark plugs play an essential role in determining the maximum power, fuel consumption and emissions. NGK is constantly developing its range of spark plugs to be up to date with the demands of modern engines. 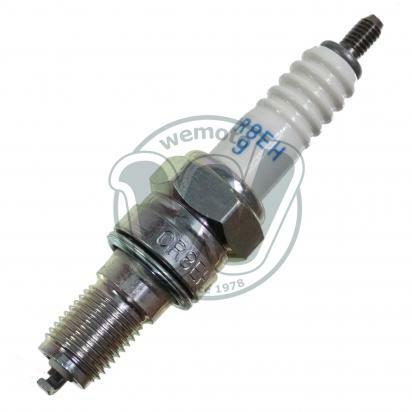 The heat range of a spark plug is essential to its life span and efficiency. Plugs must be able to run hot in order to burn off carbon/oil deposits, yet must be able to transfer heat quickly, preventing overheating and premature failure. NGK spark plugs utilize a copper wire, which has superior heat-conductivity compared to conventional iron cores. This allows heat to dissipate faster, preventing 'hot spots' that can cause pre-ignition. Heat resistance alone does not affect fouling resistance - for this a longer insulator nose must be used. Ordinarily a longer insulator nose would be more susceptible to heat, however NGK's copper core allows the spark plug to have both high heat and high fouling resistance. The CR9EK spark plug features twin grounds at the firing end. This combats 'cold fouling' by forcing the spark to discharge across the insulator, thus burning away any built up carbon that could cause poor starting or misfires. Examining your spark plugs frequently can give insights into the inner workings of your engine. An overheated spark plug may be white and blistered at the firing end, while blackened deposits indicate carbon accumulation; the plug is running at too cold a temperature to burn away carbon deposits. Even at the ideal temperature range, eventually carbon deposits will form on any spark plug, and will require replacement.